In children, the incidence of pulmonary complications after haematopoietic stem cell transplantation (HSCT) varies from 10% to 20%. Noninfectious causes, such as idiopathic pneumonia syndrome (IPS), bronchiolitis obliterans syndrome (BOS) and bronchiolitis obliterans organising pneumonia (BOOP), are considered nonspecific inflammatory injuries to the lung [1, 2]. These may represent a form of alloimmune injury to the lung after HSCT. The current view is that there is a three-step process in the development of alloreactivity: 1) tissue damage results in 2) a release of inflammatory cytokines, which results in 3) activation and influx of T-cells . First-line treatments for nonspecific inflammatory lung injuries are intravenous corticosteroids and supportive care. In four steroid-refractory, nonspecific inflammatory lung injury patients, we studied the efficacy and toxicity of fludarabine given on clinical grounds as a second-line treatment, despite the presence of respiratory viral infections. In our study, nonspecific inflammatory lung injury was defined as IPS, BOS and BOOP (also referred to as cryptogenic organising pneumonia) diagnosed by clinical symptoms, typical high-resolution computed tomography changes and/or results of pulmonary function tests (PFTs), if feasible. Clinical symptoms were defined as cough, dyspnoea, fever and oxygen requirement. Three preschool study patients were not able to perform PFTs. In patients with upper respiratory tract infection symptoms, nasopharyngeal aspirate (NPA) samples were obtained, testing for respiratory virus infection by PCR. Bronchoalveolar lavage (BAL) for bacterial/fungal cultures, viral PCR and galactomannan testing were performed as clinically indicated. Quantitative real-time PCR (TaqMan®; Life Technologies Europe BV, Bleiswijk, the Netherlands) for Epstein–Barr virus, cytomegalovirus, human herpesvirus 6 and adenovirus, and galactomannan monitoring in plasma were performed twice a week. All patients diagnosed with a nonspecific inflammatory lung injury were treated with a methylprednisolone pulse (10 mg·kg−1·day−1 i.v. for 3 days and 2 mg·kg−1·day−1 prednisone thereafter, tapering by 25% per week to 0.5 mg·kg−1·day−1). The methylprednisolone pulses were repeated every 4 weeks until a positive clinical response was observed, up to a maximum of six courses. Other immunosuppressive agents were continued and adjusted to standardised levels. Along with immunosuppressive therapy, supportive care was provided. Patients were considered refractory to steroids when no positive clinical response, or even progressive lung injury, was seen. A positive clinical response was defined as resolved pneumonia symptoms (dyspnoea, cough and fever) without additional oxygen requirement and/or, if feasible, improvement/normalisation of PFTs compared with the baseline values acquired at the start of lung injury. An absolute increment of >12% in FEV1 from baseline can be regarded as significant and an increment of 8–12% can be regarded as borderline . Computed tomography radiology was used for diagnosing nonspecific inflammatory lung injury but not to document response while clinical symptoms improved because of the additional radiation and anaesthesia burden. A partial response was defined as a sustained improvement in either clinical symptoms and/or oxygen supply but without a return to baseline values. Between 2008 and 2010, in four patients with steroid-refractory, nonspecific inflammatory lung injury, methylprednisolone pulses were replaced by fludarabine as the immunosuppressive treatment. Corticosteroids were tapered while fludarabine was given at a dose of 30 mg·m−2 every 3 weeks, up to a maximum of six courses. In addition, possible adverse events (e.g. cytopenia, alopecia and nausea) were recorded. Initially, all four HSCT patients showed good donor cell engraftment and functioning of the graft. Patients developed the first signs of lung injury at a median of 2 months after transplantation (range 2–8 months) (table 1). In three patients, respiratory viruses were detected in BAL and/or NPAs before standard steroid therapy (threshold cycle (CT) values <30 for rhinovirus in two patients and adenovirus in one patient). One patient was positive for galactomannan in BAL and showed BK viraemia. These patients with steroid-refractory, nonspecific inflammatory lung injury were treated with fludarabine, started at a median of 5 months after transplantation (range 3–10.5 months) (table 1). A positive clinical response was apparent in three patients after a median of four courses of fludarabine (range 2–4 courses). These patients showed a sustained response with neither clinical symptoms nor extra oxygen supply after a median follow up time of 21 months (range 5–36 months). The only adverse event noted was mild anaemia in patient 2 during the treatment courses, which resolved spontaneously 2 months after the last course of fludarabine. 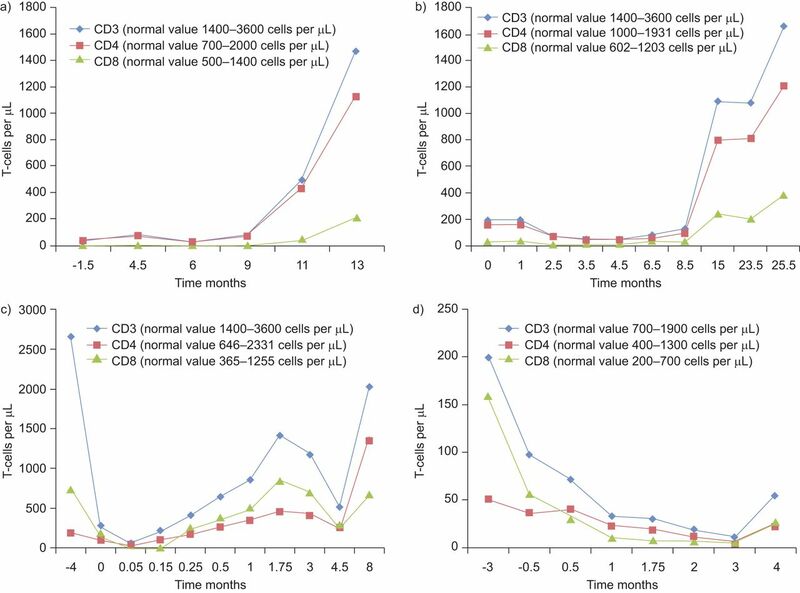 All patients showed distinct T-cell depletion with normalisation over time except for patient 4 who suffered from autoimmune cytopenia, for which he was treated with rituximab (table 1 and figure 1). Viral load (expressed in CT values) remained high in all patients but did not show an increase during treatment with fludarabine and no associated systemic viral disease was noted in these patients. T-cell counts over time after the start of fludarabine (t=0). a) Patient 1; b) patient 2; c) patient 3; d) patient 4. In patient 1, the symptoms of tachy- and dyspnoea resolved with supplemental oxygen (0.5 L·min−1) during the night. She died of relapse of her disease 1.5 yrs after the last fludarabine infusion without any sign of pulmonary symptoms at that time. Patient 2 is alive and in complete remission to date, without any respiratory symptoms, while during her fludarabine courses, she suffered from coughing, and tachy- and dyspnoea, and needed supplemental oxygen supply during the day and night. Patient 3, who has Hurler syndrome, was tachy- and dyspnoeic, and needed supplemental oxygen (2 L·min−1) when diagnosed with nonspecific inflammatory lung injury, despite steroid therapy. Fludarabine was started on the same day that he became respiratory insufficient, for which he needed mechanical ventilation. After 1 week, we decided to give fludarabine again because a clinical worsening associated with increasing T-cells was seen. Subsequently, after the second course of fludarabine, weaning from mechanic ventilation was possible and he was extubated after 2 weeks. Due to his pre-existing pulmonary condition, he still remains oxygen dependent during the day (0.25 L·min−1) and shows pulmonary symptoms for which he is ventilated overnight. Capillary blood gas analyses were indicative for chronic respiratory insufficiency with metabolic compensation (base excess 5–15 mmol·L−1) of respiratory acidosis (carbon dioxide tension 50–65 mmHg). HRCT 3 months after fludarabine treatment showed increasing ground-glass opacities with air trapping, confirming the diagnosis bronchiolitis obliterans. Patient 4 died from his lymphoma and combined immunodeficiency complicated by a nonpulmonary Aspergillus infection 17 months after transplantation and 5 months after the last fludarabine course. At that time, he suffered from no pulmonary symptoms as seen during the fludarabine courses (tachypnoea, dyspnoea, cough and additional oxygen supply). PFTs showed an overall increase of 65% in FEV1 from 1.32 L (at time of lung injury diagnosis) to 2.19 L in the following 5 months. Fludarabine as an immunosuppressive treatment modality was chosen as second-line therapy since this is suggested to be a relatively low-toxicity option leading to a deep T-cell depletion . This impact on T-cells might dampen the alloreactivity in this nonspecific inflammatory lung injury. Increasing immunosuppression seems controversial when viral infections are present, though a higher exposure to immunosuppression (because of acute graft-versus-host disease) was associated with a lower susceptibility for alloimmune lung syndromes in HSCT recipients, despite the presence of respiratory viral infections . Although the inflammatory process after lung transplantation (LTX) may be very different from that after HSCT, because other immune mechanisms besides T-cells are active , based on the success with fludarabine in patients after HSCT, fludarabine was given to a patient with steroid-refractory, biopsy-proven bronchiolitis obliterans 4.5 months after LTX for surfactant C deficiency. After Fludarabine treatment, the patient improved clinically, with less dyspnoea, a decrease in supplementary 100% oxygen from 2 to 1 L·min−1 by nasal cannula and a 24% increase in FEV1 from 0.21 to 0.26 L for 2 months. In addition, in this patient, there was a high load of respiratory viruses, which remained stable after three fludarabine courses. No side-effects, such as cytopenia, nausea or alopecia, were noted. In summary, we demonstrated that T-cell depletion with fludarabine led to a positive clinical response in three cases with steroid-refractory, nonspecific inflammatory lung injury after HSCT and a possible clinical response in another, despite the presence of respiratory viral infections and without significant side-effects.
. Acute lung injury after hematopoietic stem cell transplantation. Clin Chest Med 2005; 26: 561–569.
. Chronic lung disease after hematopoietic stem cell transplantation. Clin Chest Med 2005; 26: 571–586.
. Pathophysiology of acute graft-versus-host disease. Hematol Oncol 2003; 21: 149–161.
. Interpretative strategies for lung function tests. Eur Respir J 2005; 26: 948–968.
. Fludarabine modulates composition and function of the T cell pool in patients with chronic lymphocytic leukemia. Cancer Immuno Immunther 2011; 60: 75–85.
. Strong association between respiratory viral infection early after hematopoietic stem cell transplantation and the development of life-threatening acute and chronic alloimmune syndromes. Biol Blood Marrow Transplant 2010; 16: 782–791.
. Alloimmunity-induced autoimmunity as a potential mechanism in the pathogenesis of chronic rejection of human lung allografts. J Heart Lung Transplant 2011; 30: 624–631. How can we achieve better prevention of TB among contacts?